‘Getting the Mercury Out’ Sneak Preview! If you like what you read, don’t forget to leave a comment below! 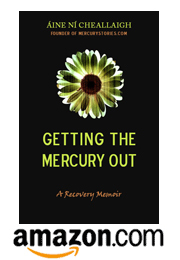 ← Mercury Detox: Coming Soon to a Memoir Near You! Great job!! Kudos to you! I can’t wait to read the rest of it as I didn’t want to stop. It reads like a mystery novel even though I know who the “bad guy” is and that our protagonist triumphs over adversity. Also, again, I want to thank you for putting up your blog. You are my first “mercury” friend. You explained about the AC book and the Yahoo group and I can’t thank you enough! I don’t know where I would be if not for you. The doctor who diagnosed me is 3 hours away and wanted me to start large doses of DMSA before…yes, before…the amalgams were removed. It didn’t feel right so I didn’t do it. Then, late one night, I found you:) After reading just a few sections of your blog, the lonliness started to leave, the hope started to come back. I had a diagnosis but no plan of attack…now I had one. Actually, until I read your blog and some of the stories from DAMS, I didn’t really believe that mercury was my problem. Stories and terrific teaching tools. I’m so glad that my blog is speaking to you. It sounds like it was exactly the right information at the right time. I agree 100% that stories are a great way to learn about something. I struggle when I’m faced with dry theoretical information. I can work with it, but in the back of my mind is always the question, Is this all just a load of made-up BS? I need to talk to the people who’ve actually applied this info to their lives. Who are they? How old are they? Give me all the background info, then start the story from the top. Nice Preview! I like your writing style. How can I order a copy? I am from Germany. The book will be available as a Kindle eBook through Amazon.com. You don’t need a Kindle device to read it though. They’ve set it up so that Kindle books can be read on your computer, whether it’s PC or Mac, and also on a whole list of devices like iPhones and iPads and Androids. Amazon.com will be selling the book as a paperback too. Shipping to Europe is not very expensive, but it takes a couple of weeks longer to arrive. Congratulations, Aine. The writing is great and I want to hear the whole story. Keep me posted! Áine, thankyou for committing your experiences to paper – I’m familiar with Cutler’s work and own both his books, but I’ll certainly be buying your book too. I’m literally on the cusp of beginning my first round of chelation (the VRP DMSA is en-route from the USA as I type this). My story is a familiar one in the sense that, like so many of us who have heavy metal toxicities, conventional medicine let me down TOTALLY. I had to arrive at a diagnosis myself, after several years of searching down dead-ends etc., being viewed by arrogant ‘specialists’ as though I must be a hypochondriac. Not only that, but it turned out that in my case, conventional medicine was actually RESPONSIBLE for my heavy metal toxicity! – I have never had amalgams but I had Hep-B vaccinations in 2002 and, of course, I now know that these contain Thimerosal. My health began to go downhill after 2002 and it took me almost 9 years e to figure out that Thimerosal was responsible for my declining dental health (derangement of mineral transport) and decreased liver functioning. I wish you well with your ongoing chelation efforts, and I hope your book meets a wide audience. It certainly deserves to, since you and I both know that there are thousands of people around the world whose health could improve dramatically if their eyes were opened to this kind of information. I am sorry to hear that you were sick for 9 years before you found out what was wrong. I was only sick for 9 months before I came across Cutler’s book, and even that was far too long. Not knowing what’s happening, or why it’s happening to you is one of the worst feelings in the world. I wish you luck with chelation! And best wishes to your liver 🙂 Nobody really appreciates what an amazing organ it is until it starts to stagger under the incredible burdens we place on it. Absolutely fabulous work! Its so refreshing to finally read something so heartfelt and real about what most of us go through in healing ourselves from mercury poisoning. Congratulations on your hard work and finding a way through the mercury!